STORMIN' NORMAN POST-PRODUCTION UPDATE 2: THE SCORE & MORE! Hello folks, producer Jonathan here and we're back with another Stormin' Norman update! So whilst Encompass has been busy with our new Bare Essentials event and pre-production for new play Who is Moloch? 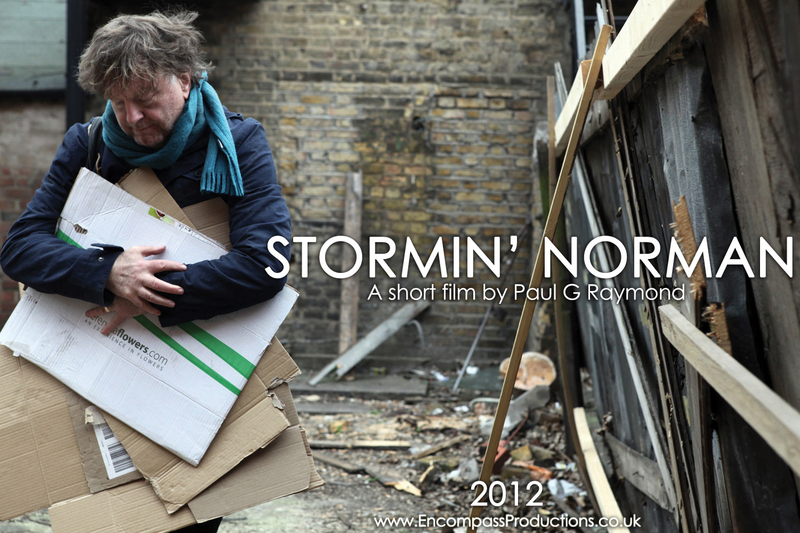 the Stormin' Norman team have been entering the final stages of post-production for this first Encompass project on film. It's been a long time coming but we finally have a cut that we're happy with. Editing a film can be a laborious process, especially when the film in question is a short one and you have less time to play with! 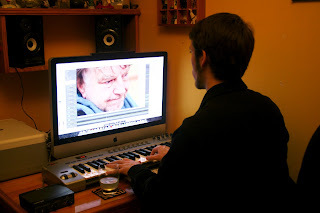 Simon (editor) has worked hard to fine-tune the film and has done a brilliant job responding to director and producer feedback - even when said feedback has been nitpicking! Perhaps no-one has been more brutal with his own work than writer and director Paul however - cutting unnecessary scenes and dialogue as he sees fit without any hesitation. It takes a certain artistic tenacity to be able to do this, a quality in Paul which I've had the pleasure of witnessing throughout this production. Pan has been readying the sound, and it'll be interesting to see what he does with the urban soundscape of East London. I think after the brilliant London 2012 we all know how vibrant the city can sound! Whilst dialogue is a key component of this short (and just how much may surprise people) it'll certainly be interesting to hear how Norman's environment changes throughout his day and in the various locations. "Creating a soundscape first can often lead to finding the right melodic material. The current film I'm scoring, 'Stormin' Norman', proved this yet again as I produced the ambient texture of the city before discovering the first melody of the soundtrack. For the final track what I wanted to achieve is a piece that not only brings the score and film to an exciting and emotional conclusion but also be a track that people can and want to listen to." 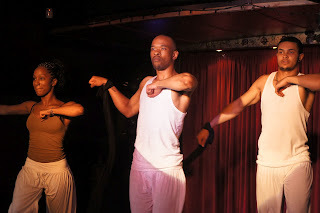 Encompass Productions present "Stormin' Norman"
BARE ESSENTIALS - PHOTOS AND REVIEWS FROM OUR EMERGING ARTIST SHOWCASE! Wow! Our first-ever 'Bare Essentials: The Emerging Artist Showcase' was a resounding success! A big Encompass thank you to all came and supported all of the emerging talent present on The Battersea Barge! A solo clown show from Charlie Henry, performance poetry from Toby Wheeler, comedy from Andy Dickinson's 'Warthogs', subtle drama from Absent Theatre Company and Mixed(up) Productions, and powerful physical performances from Political Arts. Plus Encompass ourselves performed three pieces submitted by up-and-coming writers: 'Two Children' by Christopher O'Shaughnessy, 'The Ronderbrines' by Amber Hillier and 'The Professor and La Fille Danse' by Robert M. Wallis. We were delighted to give the spotlight to our fellow emerging artists, especially on a boat! We've put a huge photo album up of the entire night, so why not check it out? AT Culture Magazine have written a fantastic feature on Bare Essentials, with particular praise going out to Encompass-performed piece 'The Ronderbrines' by Amber Hillier which was 'excellently executed'. Other mentions included Political Arts' 'The Prisoner' described as having 'powerful moments of visceral expression and solidarity' and Charlie Henry's flamenco-dancing clown as 'flamboyant...bombastic'. To read the rest of the article visit the AT Culture Website, where you'll also find heaps of features on the London arts and culture scene. 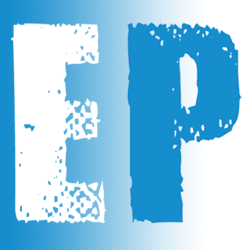 Theatre blog What's Peen Seen? also covered the event for their new feature 'Char's Stars'. Charlotte's star of the night was actually Encompass' very own Luke Manning, who performed in our staged reading of Amber Hillier's 'The Ronderbrines', an offbeat comedy about the awkward reunion of a family in a garden shed. What's Peen Seen? comments on the piece: 'I always think it’s funny how as an audience we can become so quickly lulled into believing that the characters before us are real'. You can check out the rest of the article on the What's Peen Seen? blog. 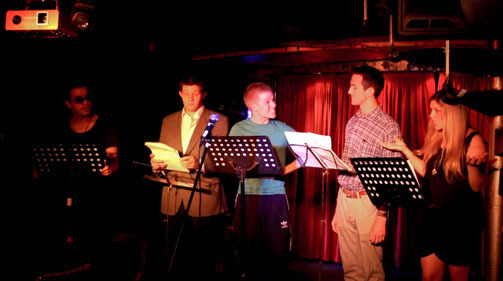 We certainly had a lot of fun performing it - and with luck this won't be the last time you hear from The Ronderbrines! 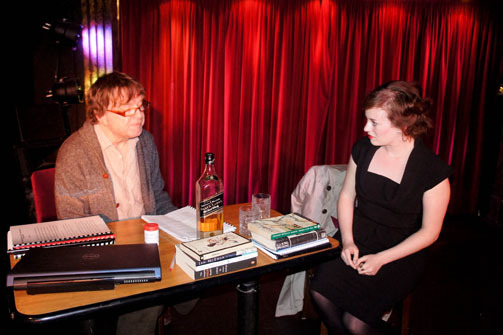 This event was in support of our next theatre production 'Who is Moloch' by Pamela Carralero, now slated for Winter 2013 in a top-secret location! We'll slowly be trickling information on the production in the coming months, and don't forget our short film 'Stormin' Norman' by Paul G Raymond is on its way to you too! If you'd like to submit anything for our next 'Bare Essentials' event, visit our website to find out more. We can't wait to do it again! Labels: Amber Hillier, AT Culture Magazine, Bare Essentials, Charlie Henry, Encompass, Political Arts Company, The Battersea Barge, The Emerging Artist Showcase, The Ronderbrines, What's Peen Seen?